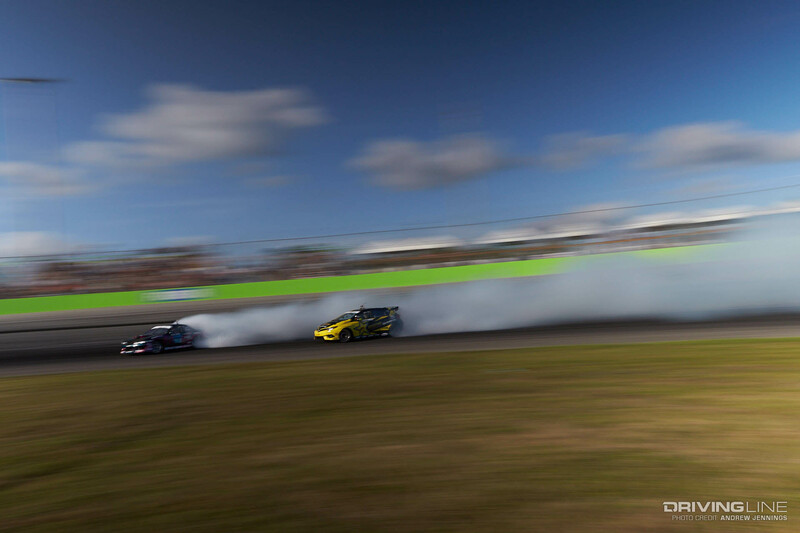 The hot and humid action tearing up the track in Orlando matched the weather report for the Formula Drift Series‘ third visit to Orlando Speed World. By now the drivers have become accustomed to the 3/8-mile asphalt oval; the track has one of the rougher surfaces on the circuit, which is part of the reason that the course used is only two big turns. Drivers initiate on the back straight, running the track in clockwise fashion around the first bank. Judges have asked the drivers to ride the wall of the bank as much as possible, treating it like a giant outside clipping zone. There’s an inside clipping point towards the end of the bank, then drivers transition off the bank onto the bumpy infield portion of the track. Drivers will transition from left to right across the infield, hitting an inside clip at the end of the infield before riding the outside line on the flat bottom of the second turn. If any drivers push a tire up onto the bank of the second turn, there will be a deduction, while sliding the front tires up onto the bank will result in an “Incomplete Run” which is the new term for a zero-point run. Overall, only 27 drivers were able to put up a score in Qualifying, which meant that the top five drivers would earn a bye in the first round. Dai Yoshihara came out tires blazing and laid down a 95-point first Qualifying run which would hold up as the top score on the table. 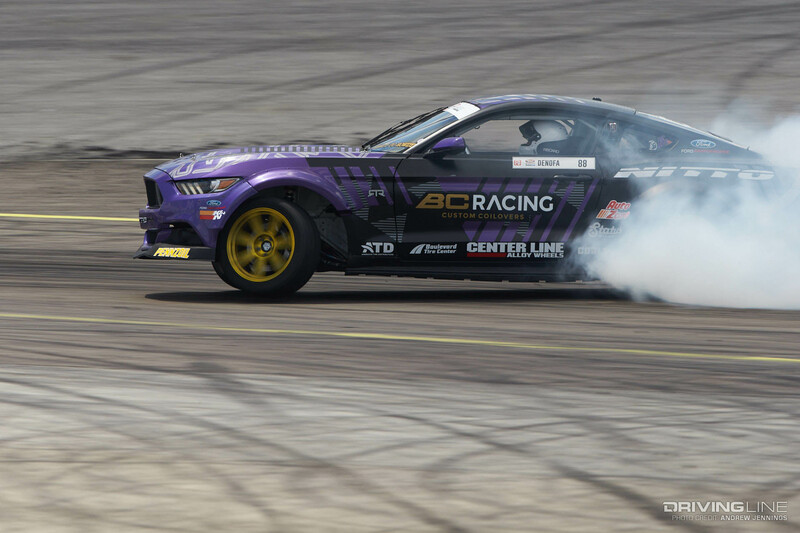 Fredric Aasbo and Ryan Tuerck both earned scores of 93, with Aasbo earning the higher qualifying position by virtue of a higher secondary score of 90 points to Tuerck’s 89-point secondary score. Long Beach winner James Deane earned 92 points on his run, while Michael Essa rounded out the top five Qualifying order with a score of 91. Robbie Nishida, who qualified in Long Beach, moved into his new Nissan GTR for this round but was unable to put up a qualifying score. Additionally, Faruk Kugay had some teething issues getting his BMW car prepped for the event and didn’t make the trip, while Georgy Chivchyan also was absent from this round. In their place, Taylor Hull made his Formula D Pro debut by qualifying 25th, and Kyle Mohan put down his first qualifying score of the season to earn the 27th qualifier position. YOSHIHARA LEAD – Because there were only 27 drivers who earned a score, Yoshihara was given a bye into the Top 16 round. In a change from past competitions, Yoshihara was not asked to make a solo pass in front of the fans and was permitted to save his car for the second round of competition. BURKETT LEAD – Burkett with a good initiation and strong angle on the bank, Hamilton has around a three car length gap through most of the bank. Hamilton closes the proximity nicely exiting the bank and into the infield, and after the transition, Burkett has a slight bobble just before the clipping point before the sweeper. Hamilton looks controlled in the chase run, and keeps proximity nicely. HAMILTON LEAD – Hamilton with a manji entry, Burkett is late to initiate drift and has a very low line and shallow angle through most of the bank. Hamilton is up along the wall, and Hamilton has a smooth transition across the infield. Burkett is four or five car lengths back while chasing Hamilton, and slides a tire onto the bank of the second turn, which counts as “off course.” Hamilton finishes strong, and should be moving on to the next round. All three judges vote for Hamilton to win. KEARNEY LEAD – Kearney is high on the bank and keeps the car on the right line around the entire bank with tons of smoke. Hull has to re-initiate shortly after the initial initiation, which will be a major deduction. Kearney looks smooth around the entire track, Hull has another mistake and loses drift just before the clipping point at the end of the infield. Upon replay, we see Hull lost drift again entering the sweeper. Kearney will be on a major advantage into the second run. HULL LEAD – Hull headed to the pits after the first run, but unfortunately, Hull already used his only competition timeout in qualifying yesterday and won’t be able to work on his car. Kearney is given a bye run, and he finishes off the set of tires that were under his Oracle Lighting Dodge Viper to keep the fans entertained. Dean Kearney moves into the Top 16. COFFMAN LEAD – Coffman called his competition timeout prior to pulling up to the line, so we briefly moved on to the next pair. Turns out, Coffman had a run-in with the wall in practice and the wall won, so Wiecek has a bye run into the Top 16. DEANE LEAD – With another great effort in qualifying, Deane will also earn a fastpass into the second round. Deane has been looking great all weekend, and earning another 16 points towards the championship will help him greatly in the grand scheme of things. DENOFA LEAD – DeNofa with a quick initiation, Castro isn’t far behind him. Castro is around three car lengths behind DeNofa through most of the bank with very similar angle. On replay, we can see that DeNofa actually lifts the front right wheel and tire of his Ford Mustang a few different times both through the bank and through the transition on the infield, which is so bizarre to see. Overall, a strong chase run from Castro and a strong lead from DeNofa — hard to call an advantage either way. CASTRO LEAD – DeNofa initiates around two car lengths behind Castro and has very similar proximity as the previous run. Castro looks very smooth around the bank with good smoke and steering angle, Castro has a smooth transition through the infield and looks to be setup nicely for the final sweeper. DeNofa transitions a bit earlier than Castro and dives inside to get tight on Castro’s door, but is too fast and collides with Castro. Looking back to the acceleration / deceleration map the area where the collision happened is a known decel area, which won’t bode well for DeNofa. All three judges agree, Castro will be moving on to the Top 16. Castro has to be towed off course, there may have been some suspension damage to the left rear of the car. Because this collision happened at the end of the second run, he will be allowed to fix his car during the break in prep for Top 16. ESSA LEAD – Essa has been absent from the podium since Long Beach 2014, a dryspell of 22 events. His Essa Autosport BMW has looked much stronger over the past few events, and the Q5 qualifying position proves that he’s looking strong. Essa was initially set to run a pair of cars with Charles Ng piloting the second chassis, but Ng had to pull out after Long Beach due to sponsorship issues. This should help Essa focus solely on his own results for the years. BLUSS LEAD – Bluss has looked dialed in all weekend, his best career finish happened last year at this same track. Bluss is high on the line and starts with around a three car gap through most of the wall, Bluss opens up the gap to around five car lengths through the infield transition and the sweeper. Jones has a good run as far as line and angle, but his lack of proximity will work against him in the judges eyes. This will definitely be an advantage for Bluss, but no major mistakes outside of the lack of proximity from Jones means that Jones still has a good chance in the second run. JONES LEAD – Jones has a good initiation and leads Bluss by around two car lengths through most of the bank. Bluss is only two car lengths behind Jones at the exit of the bank; both cars make a small adjustment after the infield transition, then Jones loses drift completely midway through the sweeper. Bluss maintains drift and finishes the sweeper with good smoke and angle. Jones will be given an “Incomplete Run” from the judges which is effectively a zero. All three judges vote for Bluss to move on to the Top 16. AASBO LEAD – Aasbo has looked much more comfortable in his Toyota Corolla iM this weekend than in Long Beach, which is likely due to the additional seat time he’s been able to put in since then. Aasbo broke a rear differential in practice, but the team replaced it and had him out before practice ended. He’ll be ready for his first tandem battle in the Top 16. RINTANEN LEAD – Rintatnen initiating smoothly, Field is a little later to initiate but instantly closes the gap and maintains less than a single car length away from Rintanen through the entire bank. Wow, this is a great chase run from Field! Rintanen has a good run with plenty of tire smoke, but Field’s proximity is just insane! Field has notably less steering angle in a few different areas of the course, but surges forward in a few different places both on the infield and around the sweeper to show how much more power and grip he has over Rintanen. This was a tactic that Daigo Saito used to use in his first season of Formula Drift, and one we haven’t seen much of since. This will likely be an advantage for Field. FIELD LEAD – Field initiates and instantly opens up a five to six car gap through the entire bank. Rintanen takes a slightly shallower line on the bank to try and close down the gap but doesn’t make much of a different. Field clearly has substantially more forward grip than Rintanen and there isn’t much Rintanen can do to overcome that. Field finishes more than seven car lengths ahead of Rintanen which makes it easy for the judges to decide. All three judges vote for Field to win. 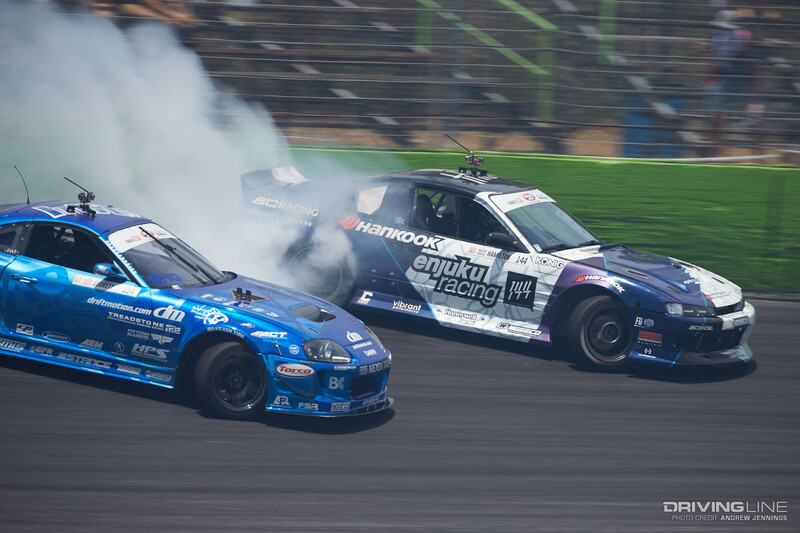 BAKCHIS LEAD – Both of these drivers are in supercharged Nissan S14s, but these drivers have very different styles. Unfortunately, Bakchis knocks over a cone in the start chicane, which means the initial run is red-flagged. Bakchis doesn’t see the flag and finishes the course in drift, which becomes a problem because this track is so harsh on tires. Hohnadell stops drifting midway through the bank, which is less harsh on the tires. Both drivers are allowed to take on new tires in the pits, and we’ll re-run the battle. Bakchis has a good run along the bank, Hohnadell is very close to the wall on initiation but moves his line down slightly shortly after initiation. Bakchis has good line and angle through the course, Hohnadell is about two to three car lengths back for most of the run. No major mistakes from either driver, but nothing impressive that is likely to earn a big advantage either. HOHNADELL LEAD – Hohnadell has a good initiation, Bakchis looks shallow after initiation then loses drift and smacks the wall. Hohnadell has good angle and smoke through the course and finishes the run cleanly, Bakchis’ car comes to a rest at the bottom of the bank. Looking at the replay, there’s no noticeable breakage or contact on Bakchis’ car, it looks like he slowly lost steering angle and just collided with the wall. Hohnadell will earn the win into the Top 16, while Bakchis gets towed off course. Tough break for Bakchis who was really looking strong all weekend prior to this. 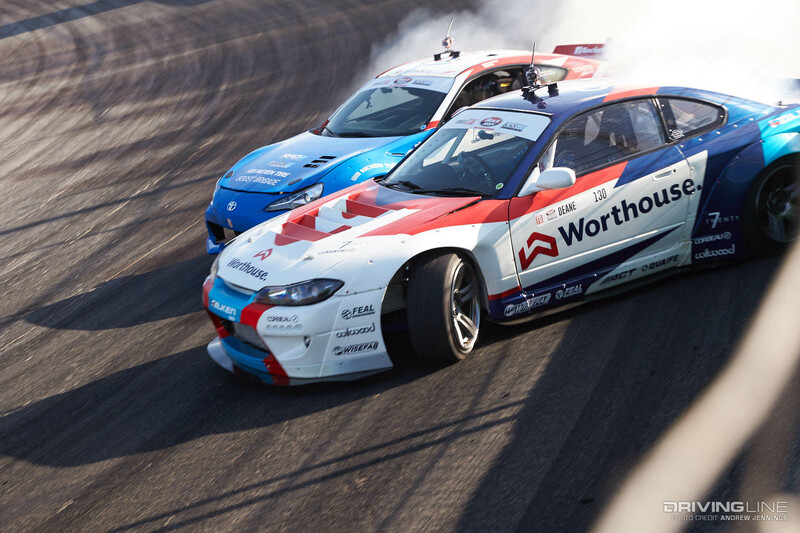 HEILBRUNN LEAD – Heilbrunn has taken second place at three straight events in his Monster BMW, including both nights of the Motegi SuperDrift Challenge at Long Beach Grand Prix. 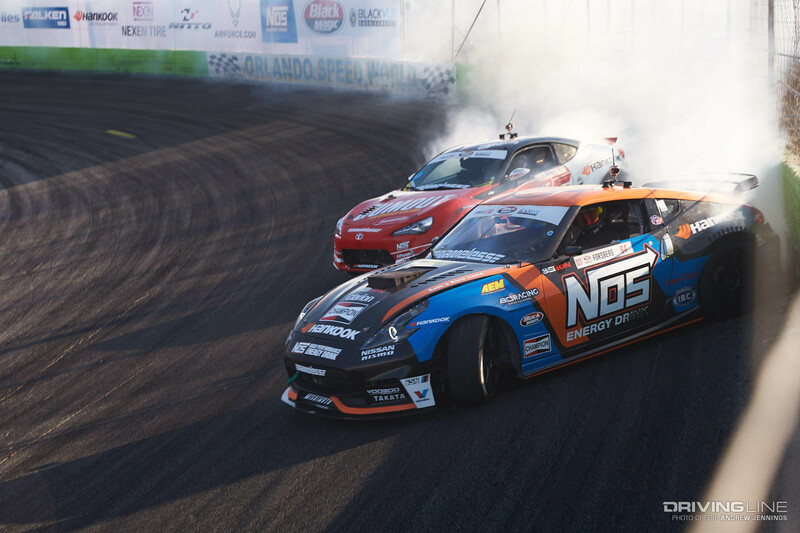 This could be his year to challenge for the Formula Drift championship! Heilbrunn initiates high on the bank, Moore initiates a little later and a little lower on the bank. Both drivers have great smoke and steering angle on the bank, Heilbrunn exits the bank around three car lengths ahead of Moore. Moore closes the gap nicely exiting the bank and gets down to around two car lengths by the exit of the infield section although with much less steering angle. Heilbrunn finishes the sweeper smoothly with plenty of Nitto Tire smoke, while Moore has noticeably less tire smoke but no major mistakes on the run. This will likely be an advantage to Heilbrunn entering the second run. MOORE LEAD – Moore has a slight feint entry while Heilbrunn has a more direct clutch-kick entry. Heilbrunn has around three car lengths of gap shortly after entry but closes the gap nicely by the exit of the bank. Heilbrunn transitions a bit late and puts tires on the wrong side of the track outline before taking out the clipping point at the end of the infield. Moore opens up a fairly substantial gap across the final sweeper with much more steering angle than Heilbrunn, finishing around four car lengths ahead of Heilbrunn. Looking at the replay, Heilbrunn’s mistakes in the infield were fairly substantial, it will be tough to determine whether it was as bad or worse than Moore’s lack of steering angle in the same section. All three judges vote for a “One More Time”; this feels more like a situation where nobody earned the win rather than a “One More Time” vote due to the runs being very good. HEILBRUNN LEAD – Heilbrunn again opens up around a three car gap ahead of Moore on the bank, Moore again closes it down nicely to a single car length exiting the bank. Moore surges forward through the infield, Heilbrunn swings very wide towards the exit of the infield and slides up onto the outer bank, which is a major deduction. Moore closes the gap nicely and stays close through the entire sweeper, which will impress the judges. This is likely a slight advantage to Moore entering the second run. MOORE LEAD – After the last run, Heilbrunn has debeaded a right rear tire, which may explain why he had less control over the final turn of his lead run. Heilbrunn is not allowed to continue with a debeaded tire, which will give Moore a bye run into the Top 16. Very unfortunate turn of events for Heilbrunn, but Moore will be content to earn his first Top 16 appearance of his rookie season. 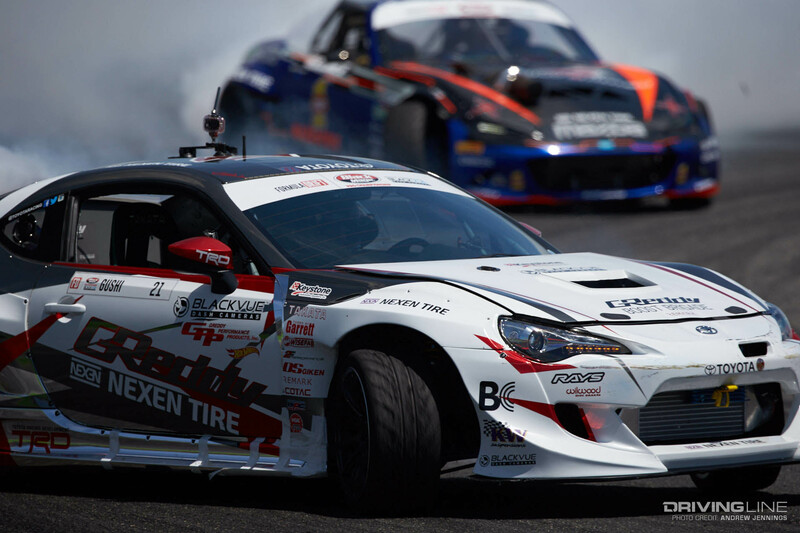 TUERCK LEAD – Tuerck has looked dialed in with his Toyota 86 all weekend, he’s also won at this track before in this same chassis. This is the second consecutive event that Tuerck has qualified in third, showing that he understands what the judges are looking for. This should be a good event for Tuerck, although he’s in a tough bracket. FORSBERG LEAD – Forsberg is still in his backup V8-powered 370Z as his twin turbo V6 370Z still isn’t ready for competition. Forsberg initiates pretty early into the first turn, Goodin initiates and is very close to Forsberg on initiation but has to slow slightly to avoid colliding with Forsberg. Forsberg opens the gap up to around three car lengths by the exit of the bank, both drivers look clean across the infield transition, and Forsberg has good angle through the sweeper. Goodin has a slightly shallower line and steering angle than Forsberg through the sweeper, but loses proximity and finishes around five car lengths behind Forsberg by the end of the run. Forsberg comes to a stop on track; it’s unclear if he broke something or is just trying to make the staff aware of something. GOODIN LEAD – It was determined that Goodin made contact with Forsberg, which was deemed to be the fault of Goodin. Forsberg was given time to look over his car and make any necessary repairs, but it sounds like no repairs were needed. We returned to this tandem battle after a few other battles, knowing Goodin was at a major disadvantage due to causing the contact. Goodin has a clean lead run, but Forsberg’s follow is aggressive and consistent. Outside of Forsberg spinning or completely dropping off course, there was little Goodin was going to be able to do to earn the win. Forsberg earns the vote from all three judges and moves into the Top 16. GUSHI LEAD – Gushi has a great line around the bank, very high with good steering angle. Mohan initiated around two car lengths behind Gushi, but quickly loses ground despite shallow steering angle and ends the bank around five car lengths behind Mohan. Gushi transitions smoothly across the infield and continues to extend the gap on Mohan through the sweeper, this will be a major advantage to Gushi. Mohan didn’t make any major steering corrections or mistakes in his chase, but the lack of proximity will weigh heavily against him. MOHAN LEAD – Mohan leaves the line and initiates into the bank, Gushi leaves the line very slowly and doesn’t initiate until midway through the bank. Mohan has a great lead run with tons of smoke, Gushi looked good after he finally initiated but it might be too little too late. Initiating late is a major deduction in qualifying points, but could be considered an “Incomplete Run” in tandem. All three judges vote for Mohan to move on; looks like they decided that Gushi’s run was a flat 0 in chase. Justin Pawlak vs. Vaughn Gittin Jr.
PAWLAK LEAD – Pawlak and Gittin Jr. have had a great rivalry in the past, both drivers have won four of the previous eight tandem battles with several of them going to a “One More Time.” Pawlak pulls away cleanly and manjis into the first turn, Pawlak has a two car gap initially but Gittin Jr. quickly closes that down to a single car length. Gittin Jr. looks to have shallower steering angle and a shallower line on the bank, but the proximity looks good. Gittin Jr. leaves around a three car gap through the transition, but closes that gap down again through the sweeper, finishing around a car length behind Pawlak. Looking at the replay, Gittin Jr. was definitely on a shallower line than Pawlak around the sweeper, but both drivers definitely showed good car control around the track. GITTIN JR. LEAD – Gittin Jr. takes out one of the cones in the start chicane, so we have to restart the run. Thankfully, both drivers shut down before initiation, to save their tires. The second start is clean, Gittin Jr. is very high on the bank and slowly gets to full angle while Pawlak is much snappier to angle after his initiation. Pawlak finishes the bank around two car lengths behind Gittin Jr, but transitions early to close the gap on Gittin Jr. We have contact! Pawlak nudges Gittin Jr. out of the way just before the exit of the infield. After reviewing the replay, judges have determined that Pawlak is at fault for the contact. Gittin Jr. earns the win and will be the sole Nitto Tire driver in the Top 16. Before we sing the National Anthem, 11 young men and women are sworn into the Air Force in front of the packed Orlando crowd. 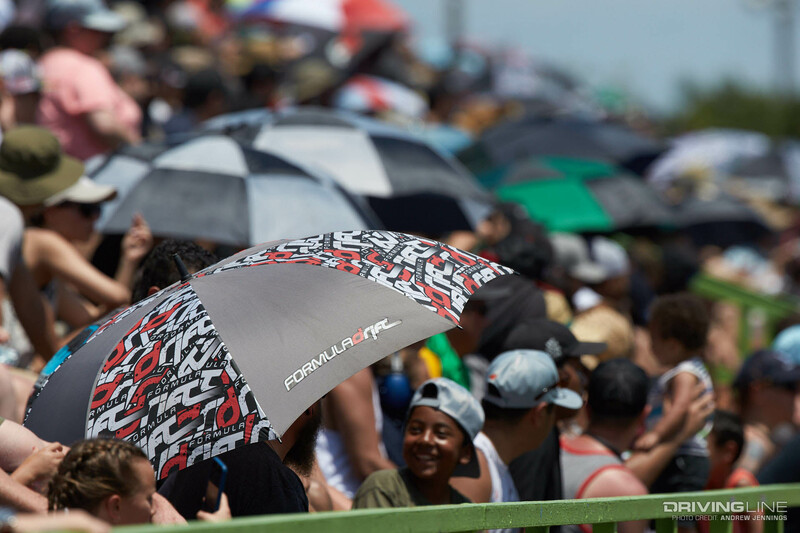 The National Anthem was played on saxophone by Bobby Lucas in one of the best renditions we’ve heard at Formula Drift. 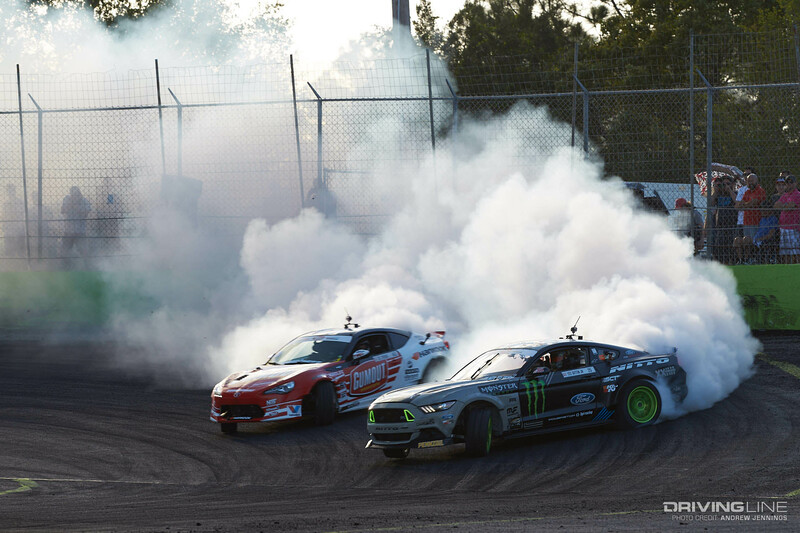 All 16 drivers were introduced to the crowd, and the typical burnouts and donuts ensued. Dai Yoshihara was handed a bag o’ cash from Black Magic for earning the top qualifier position; looks like he’s buying dinner for the crew tonight. The weather is quite warm and humid right now at the track, but the tandem action is about to heat up! YOSHIHARA LEAD – Yoshihara has a good initiation and tire smoke on the bank, Hamilton uses a manji entry which slows him down a bit, but he closes the gap through the bank. Hamilton is just a car length or two from Yoshihara exiting the bank, but Yoshihara opens up the gap again to around four car lengths across the infield. Yoshihara runs the wide line around the sweeper as requested from the judges, and likely has an advantage entering the second run. Yoshihara has looked much better this weekend than in the past few weeks. HAMILTON LEAD – Yoshihara closes the gap down on Hamilton mid-bank, then has to slow down to avoid contact. Hamilton exits the bank with around a three car gap, Yoshihara surges forward again through the infield to close the gap down to a single car or so, then Hamilton opens up the gap again through the sweeper. Yoshihara definitely finished the run closer to Hamilton in chase than on the previous run. All three judges vote for Yoshihara to move into the Great 8. KEARNEY LEAD – Kearney high on the bank, Wiecek is less than a car length away from Kearney in the middle of the bank. Kearney opens the gap up to around three car lengths as he’s exiting the bank, then Wiecek closes the gap down again after the infield transition. There was definitely a steering correction from Wiecek through the transition, but he’s very aggressive on Kearney through the final sweeper. Just a few feet before the finish line, Kearney over-rotates in slow motion and spins out. Wiecek makes very slight contact with the front bumper of Kearney, but it doesn’t look like the contact actually initiated the spin. After a few replays, it’s more apparent that Kearney was over-rotating prior to the contact, which will result in a major advantage for Wiecek going into the second run. KEARNEY LEAD – Looks like the damage to Wiecek’s car after tapping the wall on his lead run Without a competition timeout, he won’t be allowed to fix his car and Kearney will get a bye run into the next round. This probably isn’t the way that Kearney wanted to beat Wiecek, but all tandem wins count the same when it comes to championship points. Kearney moves on to the Great 8. DEANE LEAD – Deane is high on the bank, Castro is very aggressive in chase and stays within a half car length of proximity with Deane through most of the bank. Deane opens up the gap to around four car lengths exiting the bank and transitioning into the infield, Castro closes the gap down to around three car lengths through the sweeper. Castro again closes the gap down to around two car lengths through the sweeper and crosses the finish line mimicking Deane’s line and angle with perfection. This is a great run from Castro, and not something many people expected! CASTRO LEAD – Deane is about two car lengths behind Castro through the bank, but maintains the proximity through the infield transition and closes the gap down to a single car length through the sweeper. Deane’s S15 looks very calm and settled in the chase position, while Castro’s car looks like it’s having a bit bumpier ride through this surface. Looking at the replay side-by-side, Castro had better proximity through the bank but definitely had shallower angle through the transition. Deane had much better proximity through the sweeper. Very tough call for the judges to make either way! All three judges vote for a “One More Time” run — definitely the right call. DEANE LEAD – Deane high on the bank again, Castro again mirrors Deane’s line and angle with just inches separating the two cars! This time, Castro doesn’t allow Deane to open up the gap exiting the bank, and he stays aggressive through the infield by keeping the gap to less than a car length around the entire sweeper. There were times when Castro sacrificed steering angle to keep the proximity, but given how heavily the judges weigh proximity over line and angle, this will probably earn Castro a big advantage heading into the second run. CASTRO LEAD – Deane has good proximity through the bank, almost identical to Castro’s proximity. Deane allows narrowly enough room for Castro to transition, then stays aggressive on Castro’s door through the rest of the infield and again through sweeper. Wow, this is by far the best set of runs we’ve seen in Florida before! One judge votes for One More Time, two judges vote for Castro to move on. Whoa, didn’t see that coming! This easily could have gone to another “One More Time.” Judge Ryan explains on the mic that both lead runs were great, it really came down to the line on the bank on the chase runs to determine a champion, with Deane being shallower on his line. It was a very narrow battle, but enough to make Castro stand out. ESSA LEAD – An all BMW battle, Essa utilizes a turbocharged BMW engine while Bluss utilizes a Chevy small-block V8 engine. Essa initiates much earlier than Bluss, Bluss is only a single car length behind Essa through the bank but is on a lower line. Essa opens the gap up to four car lengths across the infield, then maintains that large gap through the final sweeper. Essa doesn’t have as good of a line through the final sweeper as some of the other drivers, but the big gap crossing the finish line will likely influence the judges to give him a small advantage entering the next round. BLUSS LEAD – Bluss initiates high along the wall and has a three car gap through most of the bank, Essa has a good line but can’t close the gap down very well. Bluss expands the gap through the infield and finishes the sweeper strong with plenty of tire smoke and a five car gap ahead of Essa. Looking at the replay, Bluss’ rear wheel might have ridden up on the bank around the sweeper, which would be a deduction. Some small mistakes from both drivers in each run, all three judges vote for Essa to move on. Looks like Bluss’ mistakes in chase were too much to overcome. AASBO LEAD – Aasbo is very high on the bank, Field starts about two car lengths behind Aasbo and is tight to Aasbo on an almost identical line if not slightly higher. Coming across the infield transition, Field loses some ground on Aasbo and takes a much shallower line on the sweeper. Aasbo has a very smooth run that was very similar to his qualifying run, while Field has very shallow steering angle through the sweeper and may have even lost drift before the finish line. Looking at the replay, Field may have lost a bead on his tire and riding on a flat, which would disqualify him from the competition. Formula Drift rules state that you must keep all tires beaded through two full runs, you aren’t allowed to rebead the tire between runs. If the tire is actually debeaded, that will end Field’s day. FIELD LEAD – It’s confirmed that Field has a flat and will not be able to continue. Aasbo puts down a bye run to give the fans a proper show. Aasbo will be moving on to the Great 8. MOORE LEAD – Moore has a good initiation, Hohnadell initiates a bit late but sticks to Moore just a half car length behind Moore. Hohnadell loses some steering angle midway through the bank, but stays very close to Moore. Coming off the bank, Moore over-rotates on the transition and spins, while Hohnadell runs wide and nearly spins out behind Moore. Looks like Hohnadell’s spin may be considered an independent incident, which means both drivers could be looking at “Incomplete Runs” here. That was definitely a major mistake from Moore, but it’s unclear how they will judge Hohnadell. HOHNADELL LEAD – Hohnadell with a nice initiation, he looks much smoother on the bank on this lead run. Hohnadell keeps around a four car length lead through the infield, Moore tries to close it down across the infield and into the sweeper but can’t make up much ground. All three judges side with Hohnadell to make it to the Great 8 in his hometown event. This is actually a rematch from the final here in Orlando two years ago, although the actual tandem battle didn’t happen then due to mechanical issues from Forsberg back then. These two are close friends, but the friendships end when any tandem battle starts! Forsberg has won nine of the previous twelve battles between these two, although one of those losses was due to a mechanical issue as stated. 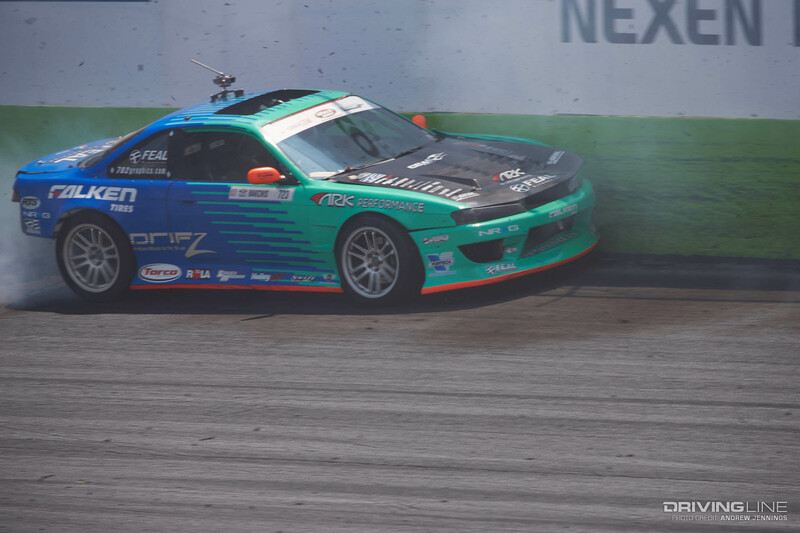 TUERCK LEAD – Tuerck is very high on the bank with tons of smoke, Forsberg has slightly shallower steering angle to keep the close proximity on the bank. 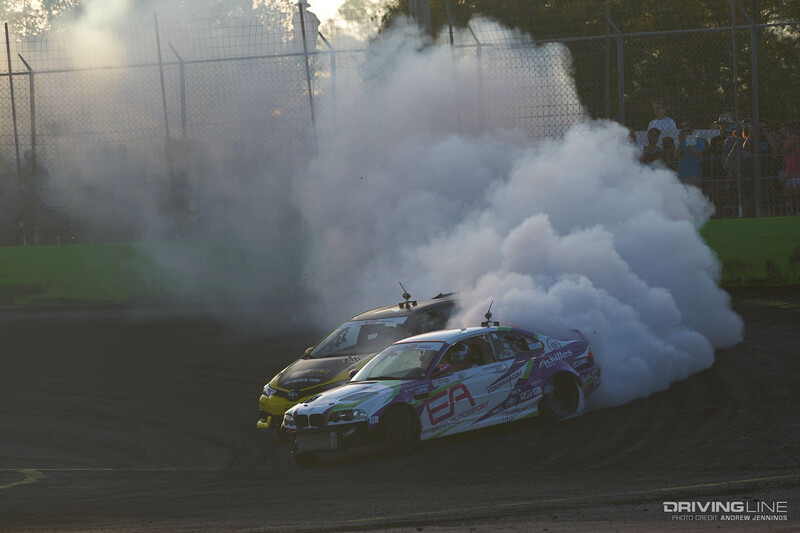 Coming off the bank, Tuerck lays down a ton of smoke and Forsberg appears to get lost in the smoke. 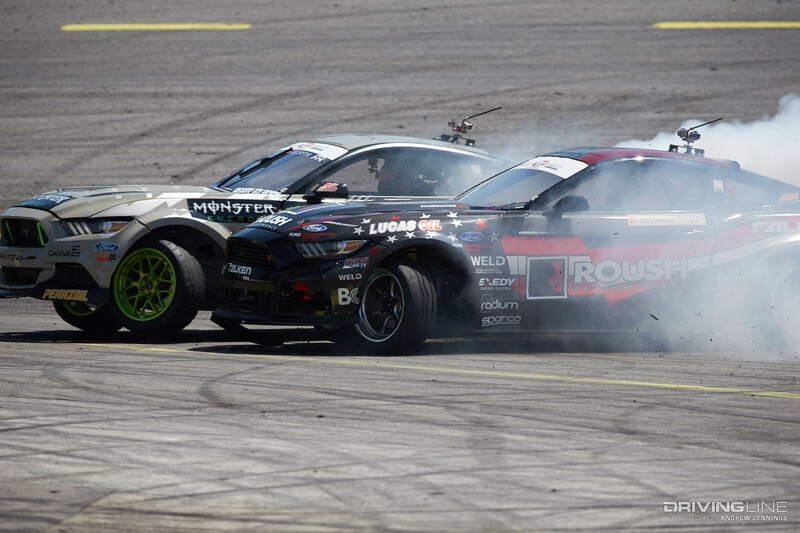 Forsberg drops back to around four car lengths behind tuerck, then slides into a shallower line around the sweeper to stay out of Tuerck’s tire smoke. This was a smart tactical move from Forsberg, but still likely to get a small deduction from the judges for taking a shallower line. Seems like there’s a slight advantage for Tuerck entering the second run. FORSBERG LEAD – Forsberg has a strong lead run, maintains around a one car lead ahead of Tuerck exiting the bank. Tuerck tries to close the gap through the infield, but Forsberg extends the lead to around two car lengths. There was a slight steering correction from Tuerck just before the final infield clip, Forsberg extends the lead to around three car lengths by the exit of the sweeper. Overall a very similar run from Forsberg in the lead, but Tuerck’s chase seemed to be a bit closer in proximity especially through the infield section. All three judges vote for Tuerck to move into the Great 8. With Deane, Heilbrunn and Bakchis all eliminated already, this will likely push Tuerck into the championship points lead for now. GITTIN JR. LEAD – Gittin Jr. opens up a big gap shortly after initiation, Mohan is struggling to keep up with the Ford Mustang. Gittin Jr. is on a higher line on the bank and keeps the gap large through the infield and the final sweeper. Mohan takes a shallow line through the sweeper to try and close the gap, but doesn’t make up much ground. Just before the finish line, Mohan spins independently of Gittin Jr.’s run. This will be a big advantage for Gittin Jr. moving into the second run. FIELD LEAD – The initial attempt at this run resulted in a restart due to a cone tap, but the second attempt will count. Mohan again takes the lower line on the bank, while Gittin Jr. stays high on the wall. Mohan opens up a bit of a gap, Gittin Jr. looks to be taking it easy around three car lengths behind Mohan to ensure he can react to any possible mistakes Mohan makes. Mohan drops a tire back up on the bank in the sweeper, Gittin Jr. adjusts well, and both drivers finish cleanly. There were a lot of mistakes on both runs from Mohan, so Gittin Jr. will get the win into the Great 8. YOSHIHARA LEAD – Dai with a nice entry, Kearney initiates around a car length behind Yoshihara but closes the gap down to a half-car length by midway through the bank. Kearney backs off a bit to allow Yoshihara to transition, and Yoshihara opens up the gap to around three car lengths around most of the sweeper. Looking at the replay, Yoshihara actually took out the cone at the exit of the bank, while Kearney had a slight steering correction midway through the sweeper. Not a perfect run by any means, but it looks like Yoshihara might have a slight advantage. KEARNEY LEAD – Kearney has a good initiation around a car length ahead of Yoshihara, Yoshihara then closes the gap down to around the ½ car length almost identically to Kearney’s run. Kearney taps his wing against the wall midway through the bank, but maintains drift and continues strong. Kearney opens up around a three car gap on Yoshihara across the infield, then Kearney adds more angle coming out of the infield and finishes the sweeper with around a three car gap on Yoshihara. The gap across the finish line was much larger on Yoshihara’s lead than on Kearney’s lead. All three judges vote for Yoshihara to move on to the Final 4. As the top qualifier, Yoshihara is now guaranteed a podium finish regardless of who else progresses into the Final 4. ESSA LEAD – Essa initiates next to the wall, Castro again initiates just inches away. Castro stays tight to Essa through the entire bank, he briefly loses around a half car length of proximity but then closes it down again towards the end of the bank. Essa opens up a small gap across the infield, Castro is nearly impossible to spot through the smoke of Essa. Essa keeps around a three car gap through most of the sweeper. We finally see Castro peak through the smoke as he takes a slightly shallower line through the sweeper, but overall another great chase run from Castro. CASTRO LEAD – Castro initiates around two car lengths ahead of Essa and keeps a similar gap through the entire bank. Castro is a bit lower on the bank than Essa was at times, but has good speed and angle. Essa keeps a fairly consistent gap to Castro through the infield and the final sweeper, finishing about two car lengths behind Castro. One judge votes for a “One More Time” battle, while the other two judges vote for Essa. We’ll see Essa in the Final 4. This was a great competition for Castro; it’s unfortunate that his day ends here. AASBO LEAD – Aasbo with a snappy initiation, Hohnadell enters around two car lengths behind Aasbo. Hohnadell takes a bit of an inside line through the final portion of the banking and slides up next to Aasbo near the exit of the bank, but loses a lot of momentum with his line and Aasbo opens up a fairly large gap on the infield. Aasbo enters the sweeper with around a five car gap, Hohnadell tries to close down the proximity but can’t make up much ground before the course ends. This will likely be an advantage to Aasbo due to the big mistake from Hohnadell. HOHNADELL LEAD – Hohnadell enters around three car lengths ahead of Aasbo, taking the top line around the first portion of the bank but pulling away from the bank a little earlier than preferred by the judges. Aasbo enters the infield around four car lengths behind Hohnadell, but closes the gap down to around two car lengths through the sweeper to put some pressure on Hohnadell as they cross the finish line. All three judges vote for Aasbo to move into the Final 4. This will be another friendly rivalry among friends between Tuerck and Gittin Jr., although this one is a bit more lopsided. Gittin Jr. has won six of the previous seven matchups between these two drivers. TUERCK LEAD – Tuerck initiates around three car lengths ahead of Gittin Jr., Tuerck uses some left foot brake to ensure he stays high on the bank before transitioning onto the flat infield. 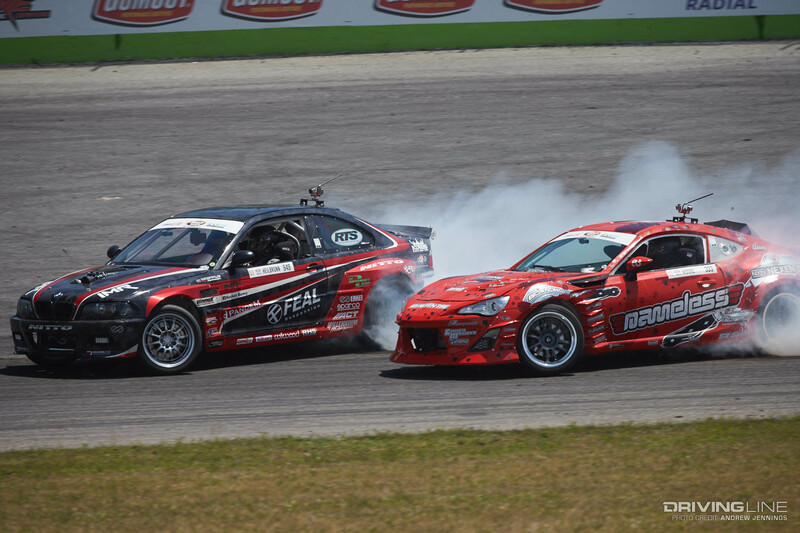 Tuerck opens up the gap to around three car lengths through the infield. He slides a little wide entering the sweeper and may have pushed a tire up onto the bank. Gittin Jr. ends the run about two car lengths behind Tuerck. Overall it’s a strong chase from Gittin Jr., but tough to call an advantage after that run. GITTIN JR. LEAD – Gittin Jr. initiates high on the bank with tons of angle, Tuerck is around two car lengths behind Gittin Jr. at the start of the bank but closes it down to a single car length by the exit of the bank. 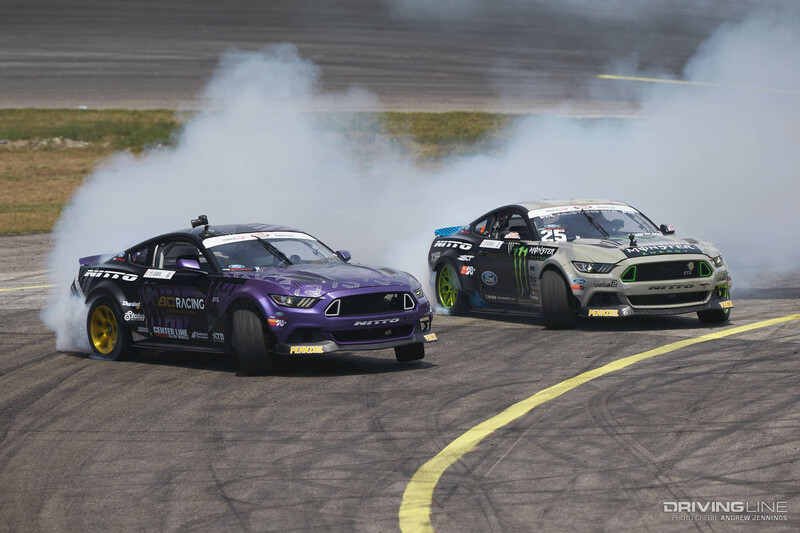 Both drivers hit the transition off the bank at almost the exact same time, Tuerck maintains good proximity with Gittin Jr. across the infield and even closes down the proximity slightly near the finish line. One judge votes for Tuerck, while the other two decide they want to see the battle “One More Time.” We’ll see these to run again! TUERCK LEAD – Tuerck initiates a bit earlier than Gittin Jr, but Gittin Jr. uses the late entry to keep the proximity close between the cars. Gittin Jr. has a slightly shallower angle through the bank, but keeps the proximity between the cars to around a single car length. Gittin Jr. closes the gap down again after the transition on the infield and takes a slightly shallower line around the sweeper to maintain the same consistent proximity through the second half of the track. This was a fantastic display of car control, which is exactly what the judges love to see! GITTIN JR. LEAD – The initial start is called back due to a knocked over cone, but the second attempt results in a full run. Gittin Jr. opens up a three car gap on the bank and maintains the gap across the infield. 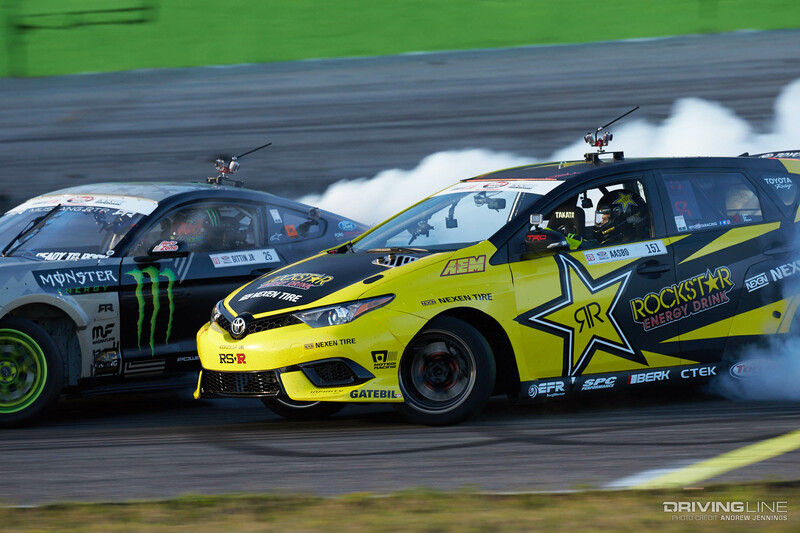 As Gittin Jr. navigates the sweeper, Tuerck stops drifting and drives off the course towards the pits. Looks like this might be a mechanical failure for Tuerck, which would be unfortunate as he’s been driving great all weekend until now. Tuerck needs to be towed off course. All three judges vote for Gittin Jr. to move into the Final 4. YOSHIHARA LEAD – Yoshihara has a good initiation, Essa initiates late and is only a single car length behind Yoshihara. Essa maintains a very consistent gap between the cars through the entire bank, Yoshihara briefly pulls an additional car length of gap on Essa towards the end of the bank, but Essa closes it down again across the infield. Yoshihara opens the gap up again to around two car lengths through most of the sweeper; Essa keeps the pressure on Yoshihara and finishes cleanly. This was a great run from both drivers — really no major mistakes to call out from either driver. ESSA LEAD – Essa has a good initiation around three car lengths ahead of Yoshihara and very high on the wall. Yoshihara isn’t able to close the gap much through the bank; both drivers exit the bank and transition onto the infield smoothly. Essa loses his front bumper and then runs it over, but Yoshihara doesn’t seem to notice. Yoshihara uses the inside line to close the gap down slowly through the sweeper. All three judges vote for Essa to move into the finals! Yoshihara will take the third podium step due to being the top qualified driver. The loser of the next battle will have to settle for 4th place. AASBO LEAD – Gittin Jr. initiates around three car lengths behind Aasbo, but closes the gap down to a single car length by the exit of the bank. Aasbo opens the gap up to around five car lengths on the infield, and maintains a large gap around the sweeper on the outside line. Gittin Jr. tries to cheat the line a bit, but can’t close the gap at all. GITTIN JR. LEAD – Gittin Jr. initiates high on the wall, Aasbo is less than a car length away from Gittin Jr. Aasbo sticks tight to Gittin Jr. through the infield and holds almost an identical line around the final sweeper. Aasbo uses slightly less steering angle to keep from hitting Gittin Jr., but maintains almost perfect proximity to Gittin Jr. across the finish line. This was a fantastic chase run from Aasbo, and although Gittin Jr. did exactly what the judges asked for as a lead car, the chase from Aasbo was one of the best we’ve seen all day. All three judges vote for Aasbo to move on to the Finals! Both of these drivers have a single championship to their name, and are looking to become only the third driver to win multiple championships. Essa’s in the same chassis he won his championship in, while Aasbo is in a brand new chassis this season. Essa owns a winning record over Aasbo, winning two of the three previous tandem battles between the drivers. AASBO LEAD – Aasbo has a very snappy initiation and starts with around a three car gap on the banking. Essa closes the gap down to around a single car by the exit of the bank. Aasbo opens the gap back up to around three car lengths as both drivers transition across the infield; Essa slides a bit wide and drops at least one and possibly two tires off course. Aasbo finishes the sweeper cleanly with around a three car length gap on Essa. This will likely be a slight advantage to Aasbo entering the second run. ESSA LEAD – Essa has a good initiation and is high on the bank, Essa taps the top of the wall while Aasbo uses a slightly shallower line and less steering angle to close the gap down from around three car lengths down to a single car length. Essa holds his composure and exits the bank with a slight single car lead against Aasbo. We have a winner! Both drivers are brought back to the infield, in front of the grandstands. Both drivers get out of their cars and congratulate each other. Dai Yoshihara joins them as the third place finisher. Fredric Aasbo is announced as the winner; he now joins Vaughn Gittin Jr. and Samuel Hübinette with the most all-time event wins at nine. 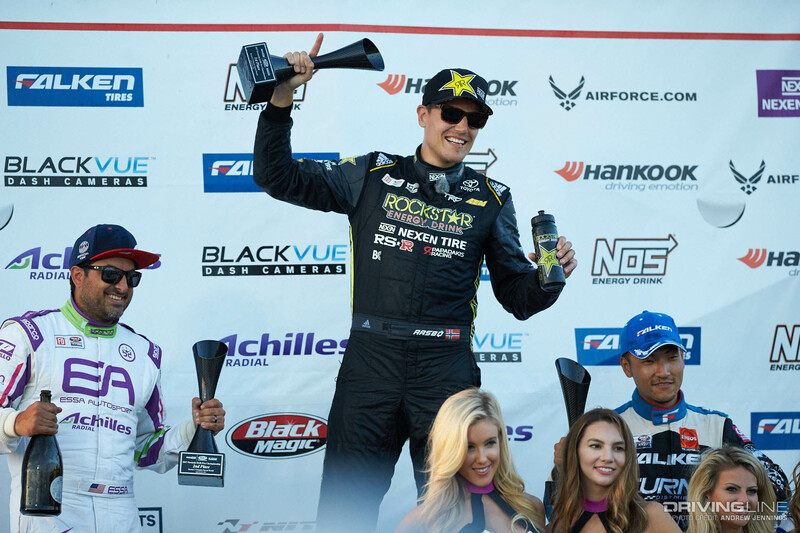 Essa earns his first podium since Long Beach in 2014, and is now back in the championship chase for the first time since he won his championship back in 2013. Aasbo jumps into the championship lead overall, with James Deane moving down to second place in the championship chase. See complete standings at FormulaD.com. 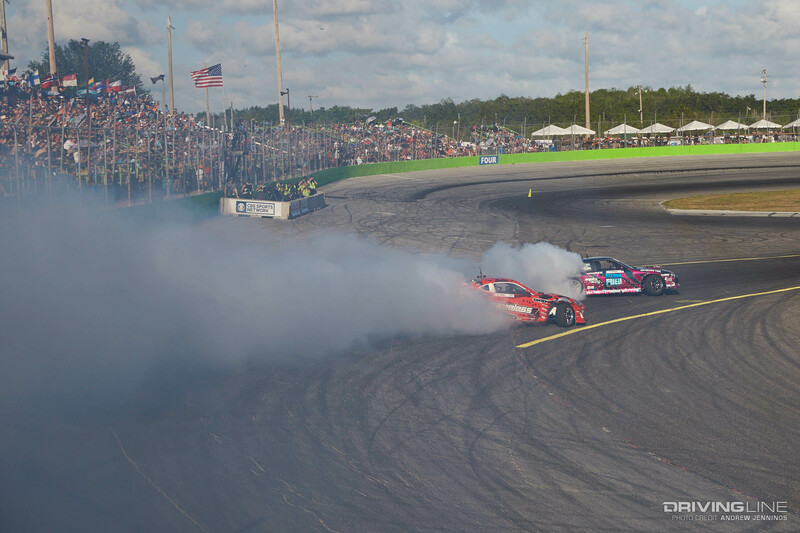 Stay tuned for more tire-smoking, wall-scraping action in our FD Orlando recap gallery. Posted in Behind The Scenes, Events | Tagged Alex Heilbrunn, chelsea denofa, Nitto Tires, Orlando Speed World, Round 2, Vaughn Gittin Jr.